With a hat tip to my science writing friend, the inimitable Steve Silberman, here’s a story about a Czech citizen who has won the right to wear a colander on his head in the photo on his government ID. Got some more substantive stuff going for this space, but couldn’t resist this little niblet. What’s saucing your spaghetti today? *Full disclosure: the Think Progress piece at the link connects back to the Daily Mail, and I have presumption of distrust at anything from that particular source. But there is a category of journalistic endeavor known as the “too good to check” story — and in my view, this is one of those. You’ve been warned. 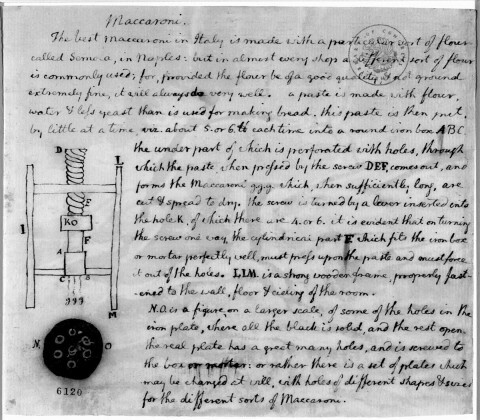 Image: Thomas Jefferson, Design for a maccaroni (sic) making machine, c. 1787.